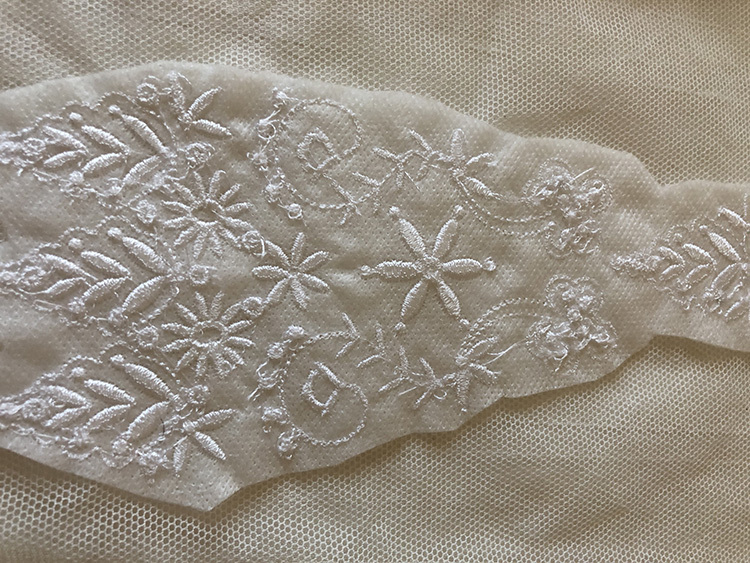 Ever since I visited Hampton Court Palace in London with my friend, Pamela, to attend an exhibition on white work by the Royal School of Needlework, and we also went to Jane Austen’s home at Chawton, Hampshire, which also had marvellous examples of embroidery including babies bonnets, I have felt the need to digitise more white work embroidery. My latest collection is a result of these visits, and I have named it Regency Whispers. 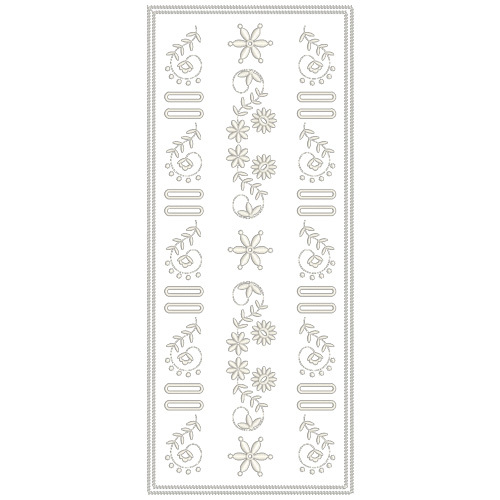 I have added ovals, scrolls and suitable motifs to the several types of flowers and tiny leaves in these designs. The Regency period in Great Britain began when King George III died in 1811, and his son the Prince Regent became George IV and some consider that it continued until Queen Victoria came to the throne in 1837. Most decoration was done by hand as the industrial age had yet to begin. After studying the embroidery that was done in the regency period and the wonderful patterns that were published regularly in Ackermann’s Repository, it was great fun to create this collection. Do take a peek at what inspired me. Here are some designs from this collection, soon to be released. I can see this design on the back yoke of a jacket. 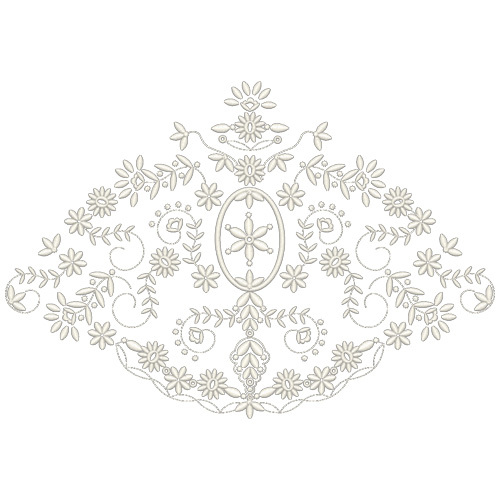 I love this oval design with its pointed scallops. I do wonder how these would stitch out in silk thread on silk dupion! I love the panels which were used in this period, and have added the simple buttonholes which can be left uncut or threaded through with some ribbon. Take a look at this design which I have created to be stitched in a row. It’s one of my favourites in the collection. Place two together and you get an interesting edge. I can see this surrounding the hem of a dress on one of Jane Austen’s heroines, like Emma. Here is what the combination will look like. Of course you may want to add one of the smaller designs in the middle. Now I love to experiment with colour, threads and also with fabrics. I began to wonder how these designs would stitch out on English cotton net. I had serious doubts as to how it would turn out. I used Floriani wet and gone, deciding on two layers. The results were excellent but I knew it would only be when I washed away the stabiliser that I could be absolutely sure it had worked. This is the panel for the 3rd set before I washed the wet and gone away. I trimmed the jump stitches and as much stabiliser as I dared beforehand. This is the finished design and I think the results are great. It just goes to show that you will never discover if you do not experiment. Here is a close up to prove the point. 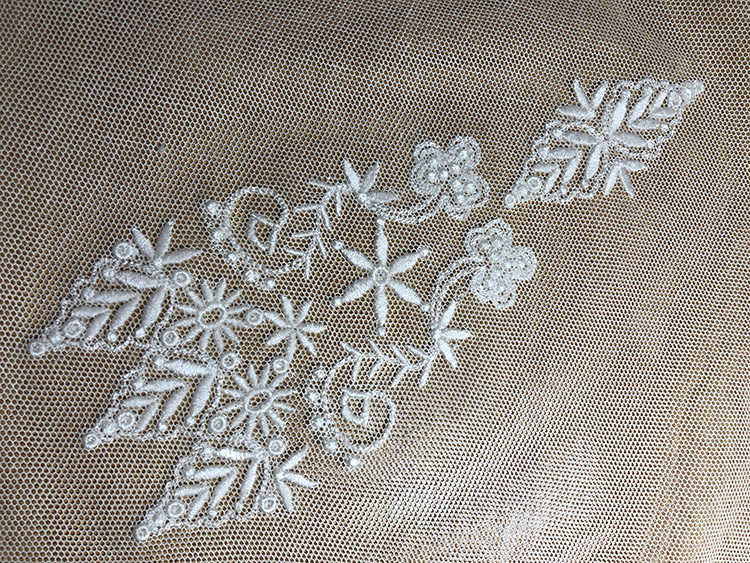 I also embroidered a design with English cotton net layered over silk. Here is a freebie for you to test out and all 5 sets in this collection have been released today, 9th April 2018. 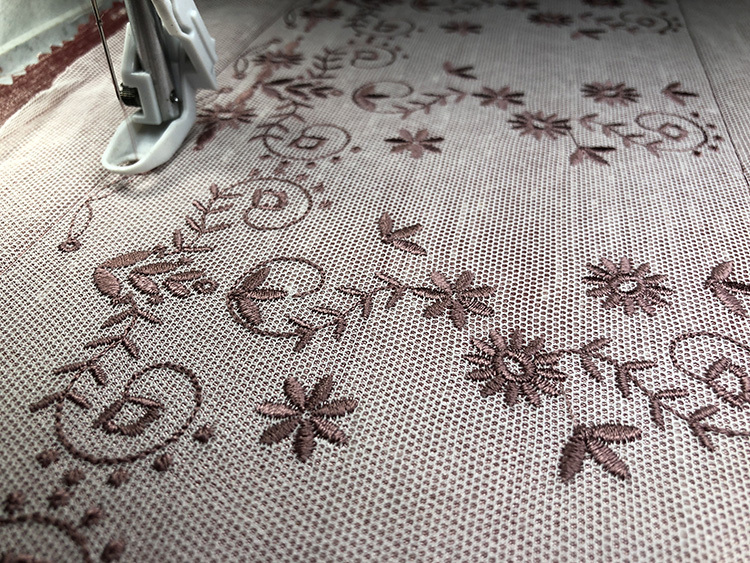 Remember that these designs will embroider out in any colour especially if it is tone on tone, that is embroidering in the same colour as your fabric. 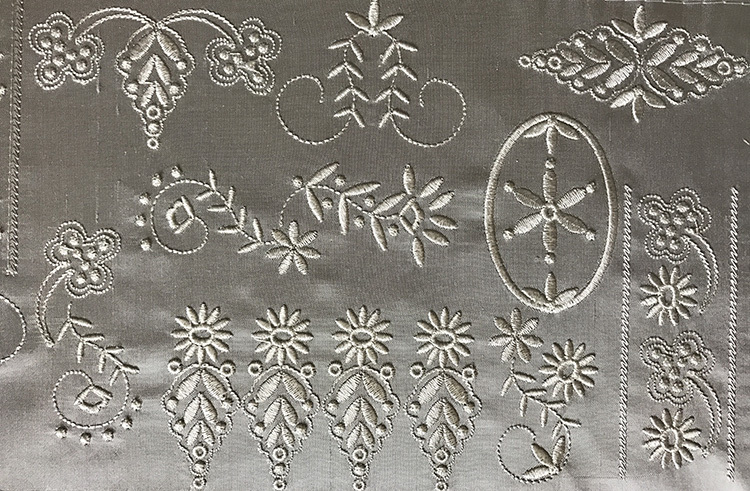 Gallery | This entry was posted in Discussing machine embroidery, New Designs and tagged development of embroidery, english cotton net, heirloom embroidery, machine embroidery, white work embroidery. Bookmark the permalink. Nicely done. 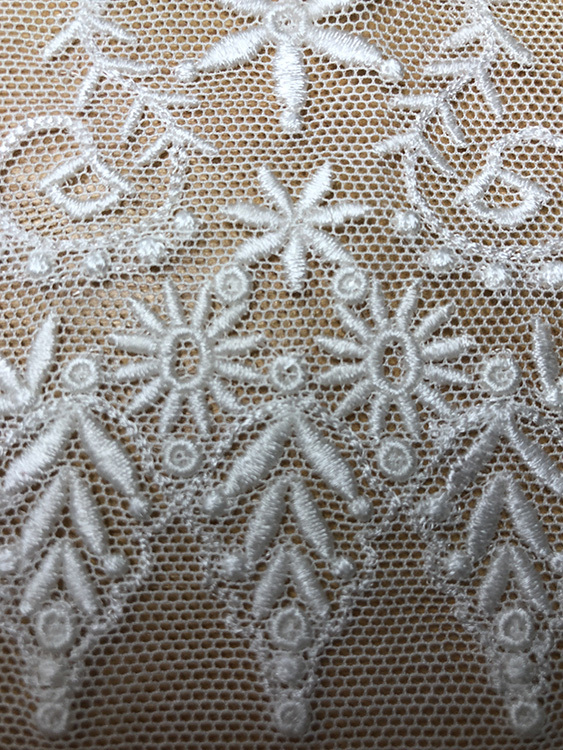 The stitches sit nicely on the lace. Beautiful! I love the shape of them. So elegant. Beautiful. May I ask what type of stabilizer you used under the netting? Gorgeous! I would love to try some, but can’t find where to download? For whatever reason, I was unable to d/l the sample. Sorry. I will send it to you in a while. OH! I am so excited! I will anticipate the internet settling down & look forward to receiving these beautiful designs. Thank you for letting us know what stabilizers to use. 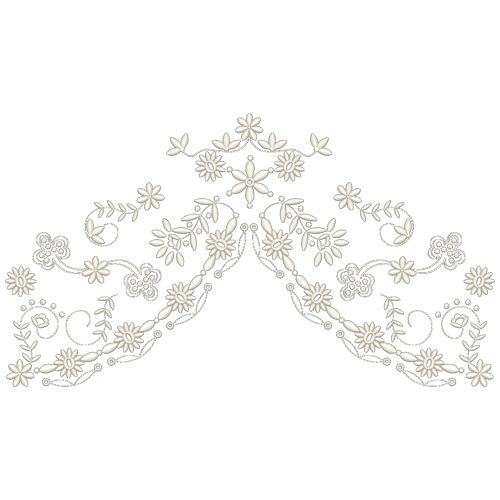 HI Hazel, You arranged the beautiful, old style individual designs in this collection into a variety of phenomenal combinations, These designs embroidered on a wedding veil, wedding dress, ring pillow, and other wedding items. 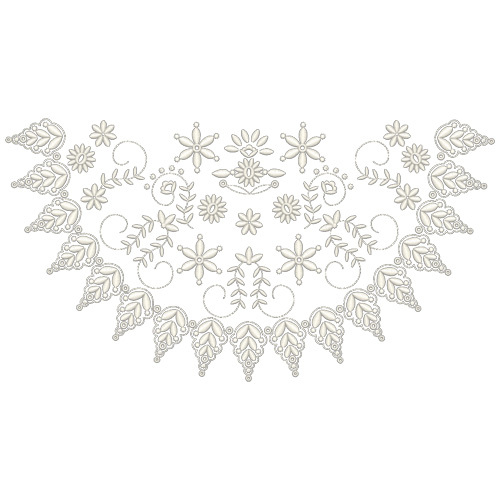 would make an exceptionally beautiful wedding ensemble., and it would be so easy to add pearls to any of the designs in this set for added embellishments.Any of these designs will give an exquisite ambiance to any item they are embroidered on. This set also lets anyone show off their own creativity by combining any of the designs using their own artistry. Thank you for all your lovely comments. This one has been chosen as comment of the week. 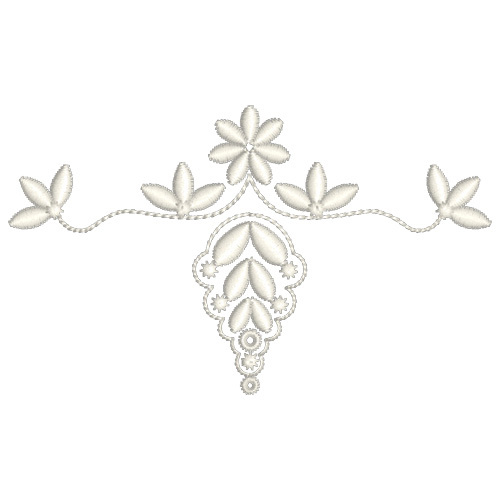 Hi Hazel, These designs would be lovely on a Christening gown–so delicate. I was unable to download the free sample. If possible, I would like it sent to me by email. Thank you so much! I would love to buy this whole set but when I go to site it says $35 but at checkout $65. Also summer meadow you have offered for $35 and again comes up on checkout $55. I am not sure what I am doing wrong. Thanks for your help. I have many of your designs and LOVE them !